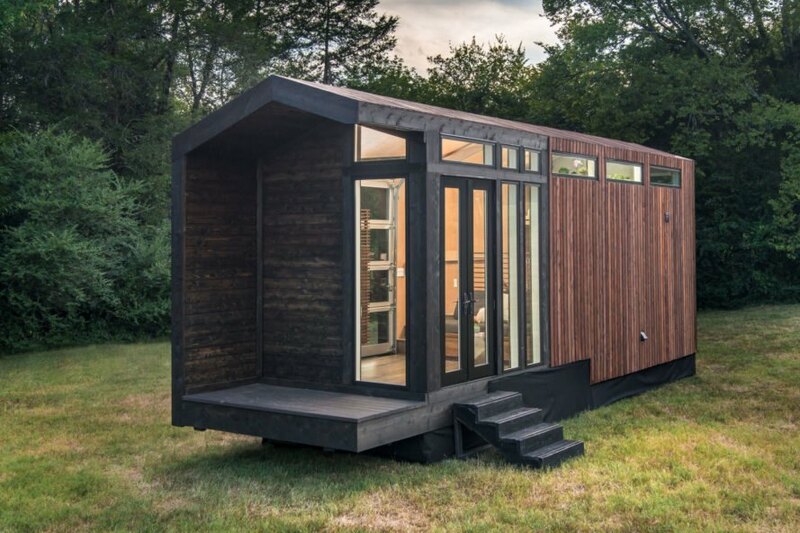 Who says a tiny house can’t be luxurious? 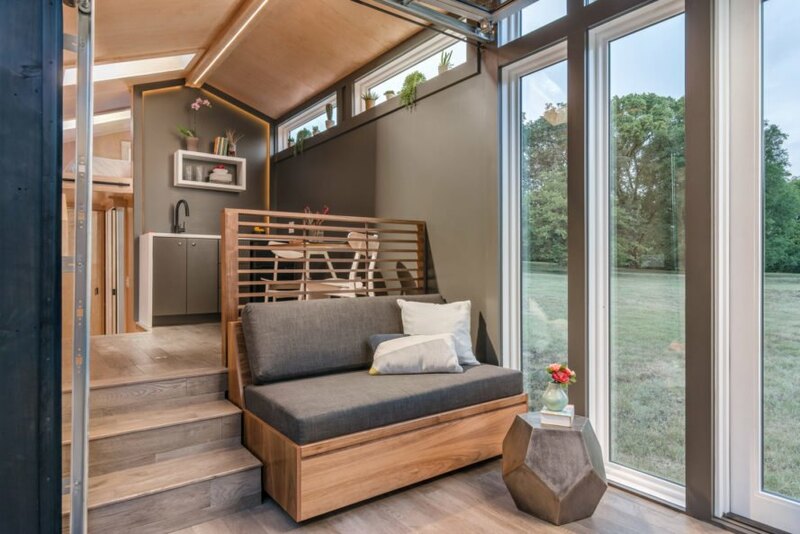 Certainly not David Latimer and Taylor Mallon of New Frontier Tiny Homes, designers of this comfortable and alluring solar-powered tiny home. 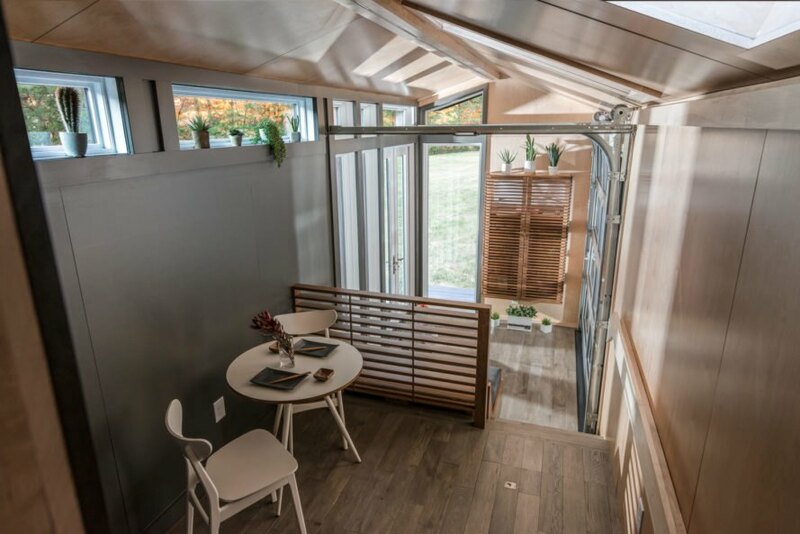 The contemporary farmhouse style of the Orchid House allows for off-grid living without sacrificing comfort, and it is entirely powered by solar energy. Though it was built in Nashville, the Orchid House currently resides on an undeveloped piece of property in Southern California. 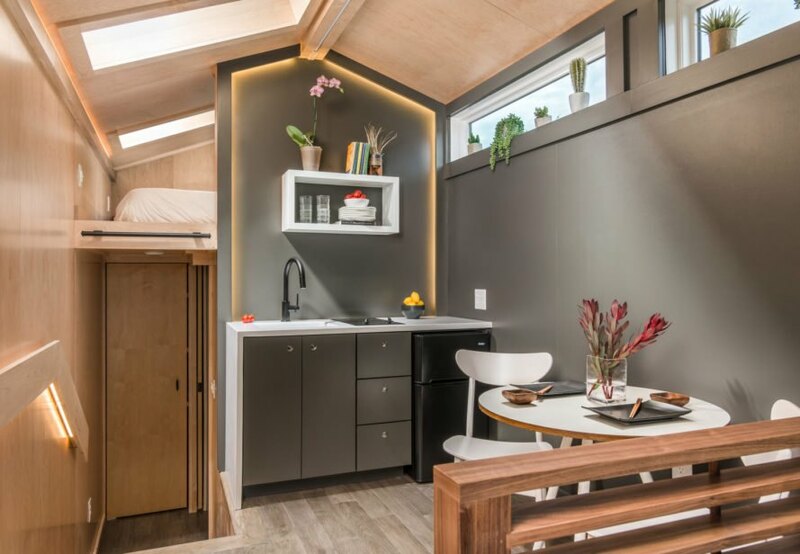 The owner is an LA-based artist who decided a tiny house was the best option for the remote space. The structure is built on wheels, so it can be moved easily for relocation or emergencies (like wildfires, from which it recently had to be saved). The structure is wholly powered by the famous Southern Californian sunshine. Both the siding and the roof of the house are made of the same dimensional cedar. The designer used an intricate process to give the roof a floating appearance inspired by Scandinavian architecture. 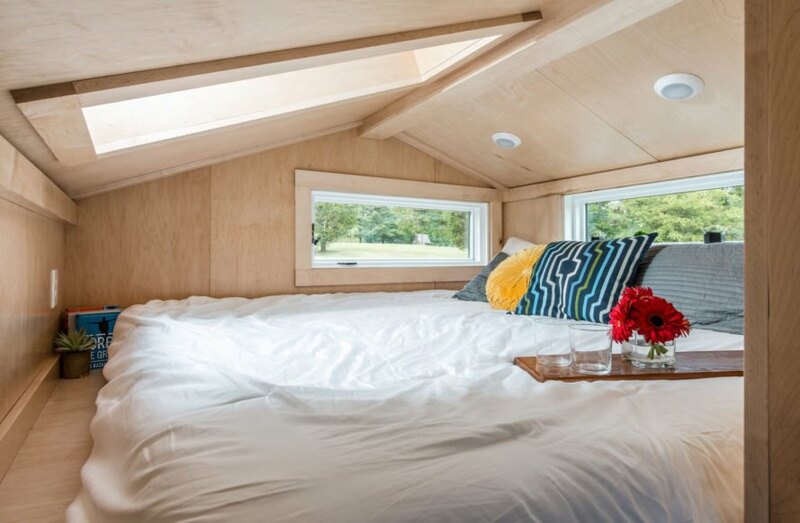 The inside walls and ceiling of this beautiful tiny home are made of maple plywood, except for inside the bathroom, which is made entirely of tile and mirrors. The floor is solid oak and all the furniture is walnut. New Frontier Tiny Homes custom-built all of the furniture except for the kitchen table and chairs, which are from West Elm. A combination of floor-to-ceiling windows and skylights brings natural light into the entire dwelling. A garage door allows for the opening up of the entire wall as well, so there’s a sense of openness between the interior and the natural environment outside. The designers’ love of clean lines inspired the storage, which is completely hidden. The open-floor plan makes room for a guest area, and the loft has space for a lavish king-sized bed. The restroom features a full-sized shower and “The Rolls Royce of non-flushable toilets,” according to the designers. The incinerator toilet ensures there are no pesky sewer or septic systems for the property, making it both uncomplicated and environmentally friendly. As gorgeous as this home looks during the day, it is just as breathtaking at night. Inspired by a total solar eclipse witnessed in 2017, the designers used valence LED lighting strips to create a lovely glowing effect around the light fixtures and front porch. Each lighting strip can be dimmed and has a separate switch. 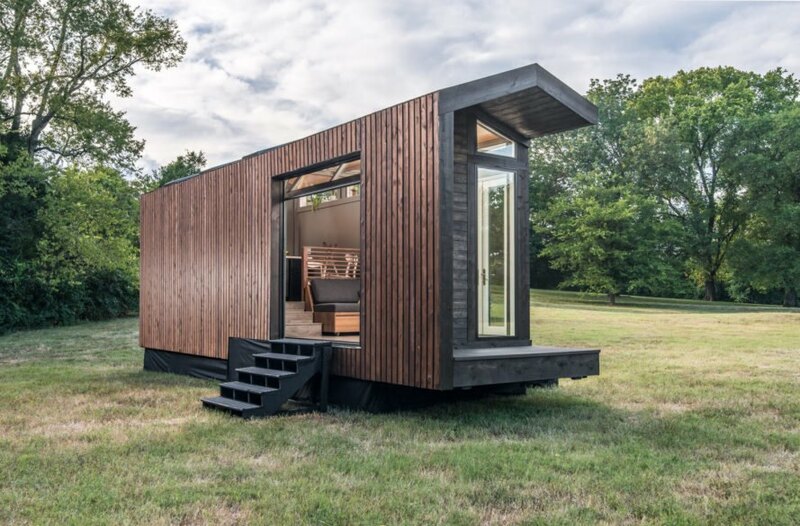 New Frontier Tiny Homes designed this solar-powered tiny house for off-grid living. The home features a minimalist, modern farmhouse design. Inside, skylights bright the house naturally. New Frontier also custom-built most of the furnishings. A streamlined kitchen keeps clutter at bay. The cozy loft is spacious enough for a king-sized bed. 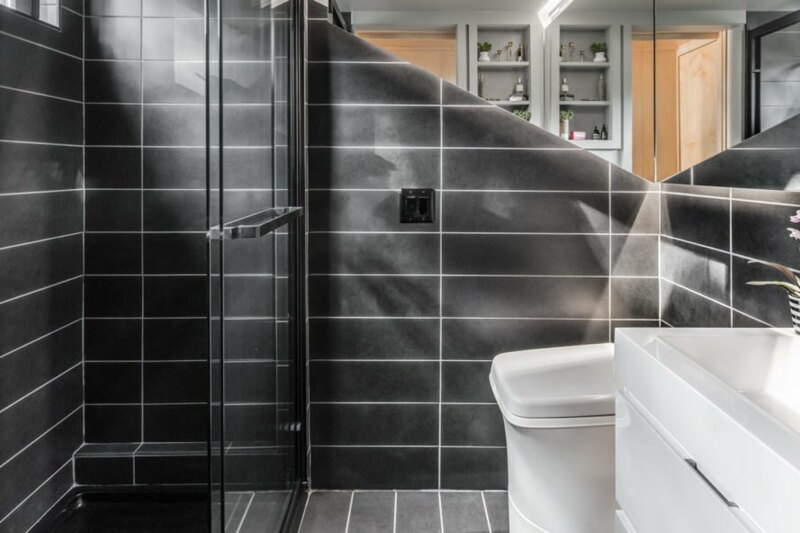 A spa-like bathroom features dark tiling and a composting toilet. The open-floor plan offers plenty of room for relaxing. This area can also transform to make room for extra guests. The home's design is inspired by a total solar eclipse.